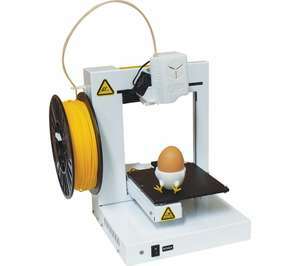 Currys are currently selling this 3D printer for £599.99 over £50 cheaper than Amazon. It looks to have some really good reviews and would be a great present for anybody interested in 3D printing, or yourself,in time for Christmas. The prices on these printers are falling faster than the value of the Pound; You can buy them from £50 now, with one similar to that featured here costing around £100 - £150. Handy for printing your breakfast. So why is it featured there in the first place?, I don't get it, lol. True,good point ...So why is it featured there in the first place?, I …True,good point ...So why is it featured there in the first place?, I don't get it, lol. It was available when I posted it. Maybe They leave the listing up for reference because the shops still sell them. As I said, it's still comparatively very expensive for such a small print volume.